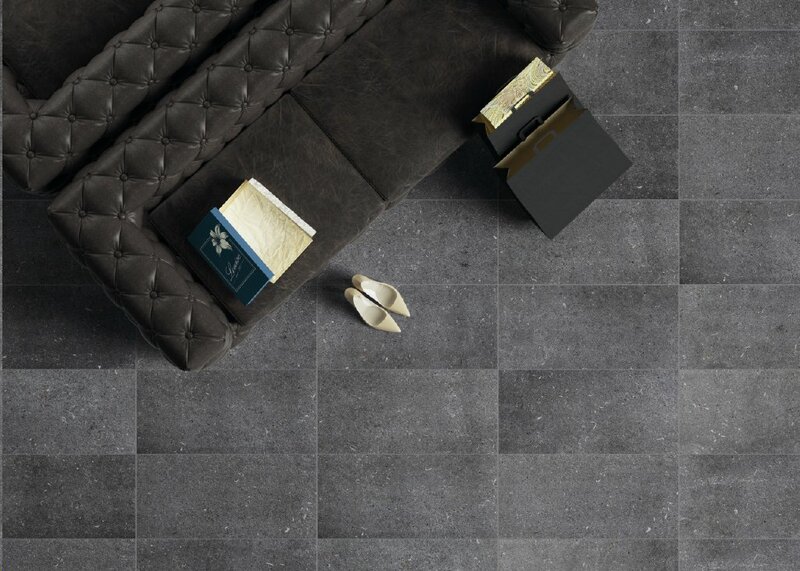 Florida Tile brings the look of natural fossilized shellstone into the modern era with the introduction of SpanHDP – High Definition Porcelain®. “SpanHDP is designed after a single large piece of deep blue shellstone harvested from a quarry in Belgium. The deep blue color tone with large fossilized sediment is a classic that has been a staple in floor design all over the world.” says Sean Cilona, Florida Tile’s Director of Marketing and Product Development. “Using that piece of stone as an inspiration, we have created a line with contemporary formats and the American design aesthetic in mind. Also, the remarkable bushammered finish of that original target was duplicated in our surface making it appropriate for a host of applications, residential and commercial, indoor and outdoor.” Cilona says. As part of Florida Tile’s newest innovation in product development, SpanHDP incorporates Microban® antimicrobial technology into the tile surface. Microban® works continuously, inhibiting the growth of bacteria, improving visible cleanliness, and reducing odors—an amazing tool in the hands of architects and designers looking to develop exceptional environments with high performance in regards to cleanliness and ease of maintenance. Recreating a level of natural beauty and elegance that few surfaces can match, SpanHDP is available in four color choices: Snow- a light, off white; Cream-a medium toned tan; Silver- a light gray; and Baltic- a dark slate gray. Two contemporary large formats, 12×24 and 24×24 offered in both natural and flamed textures will beautifully compliment any décor. With rectified edges produced by new equipment in the Florida Tile manufacturing plant, SpanHDP features precise dimensions that allow it to be installed with very narrow grout joints for a seamless, contemporary look. For exteriors, SpanHDP is offered as a pressed 12×24 tile with a flamed texture available in Snow and Silver colors. And two mosaic tile choices: a 12×24 random sized pattern tile and a 12×12 basket weave pattern, compliment the line, along with Bullnose in all four colors. SpanHDP is made entirely in the USA at the Florida Tile Green Squared Certified manufacturing plant in Lawrenceburg, KY, of 40% pre-consumer recycled content. It meets the DCOF AcuTest requirements to be installed in wet areas and is GREENGUARD® and Porcelain Tile certified.